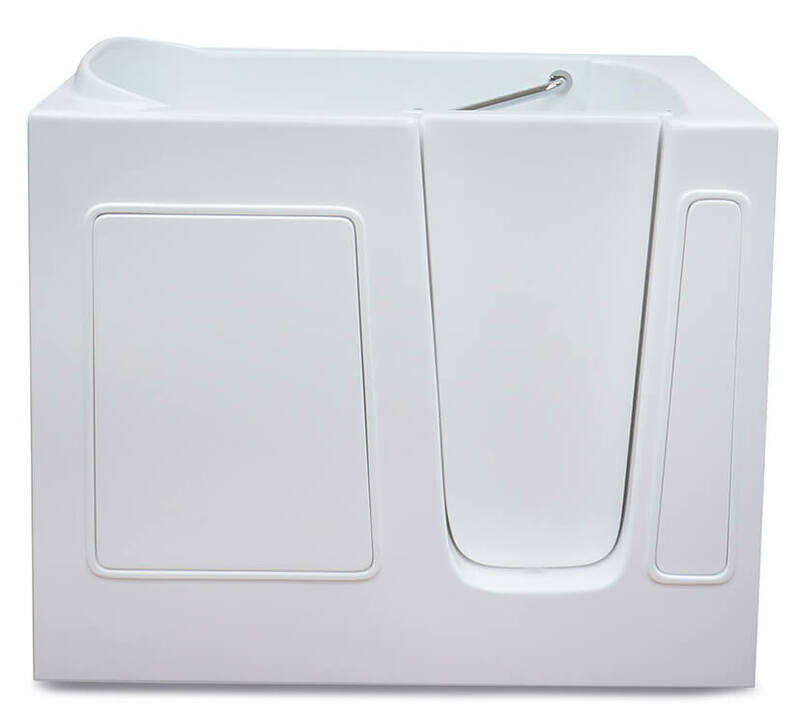 The Care 3048 is a safe option for anyone who wants a little more room while they bathe. The bathroom is an essential room for all of us as we perform our daily hygiene rituals. However, the bathroom is also one of the most dangerous rooms in the house due to our susceptibility to slips and falls. We design our walk-in baths to ensure that these types of injuries can be avoided. Your CARE 3048 comes with an ergonomically designed, lightweight, water-tight door with a low 6″ threshold that ensures that you can enter and exit your bath safely while minimizing the hazards that come with wet bathroom floor surfaces. In addition, a textured, non-slip floor comes standard in each of our tubs, which provides firm footing while you position yourself for bathing. Nestled comfortably inside your tub along with a fully integrated safety grab bar and an additional U-bar is our ADA compliant 17″ seat. Collectively, these standard components ensure that you can ease yourself into the bath while also being able to adjust yourself while sitting and standing during bath time. You can be assured that every aspect of your safety has been taken into consideration in the design and fabrication of our walk-in tubs. We care about you and your well being, so you can relax, unwind, and heal, feeling secure and assured in the CARE 3048. Along with your safety, your comfort and convenience are a top priority for us. 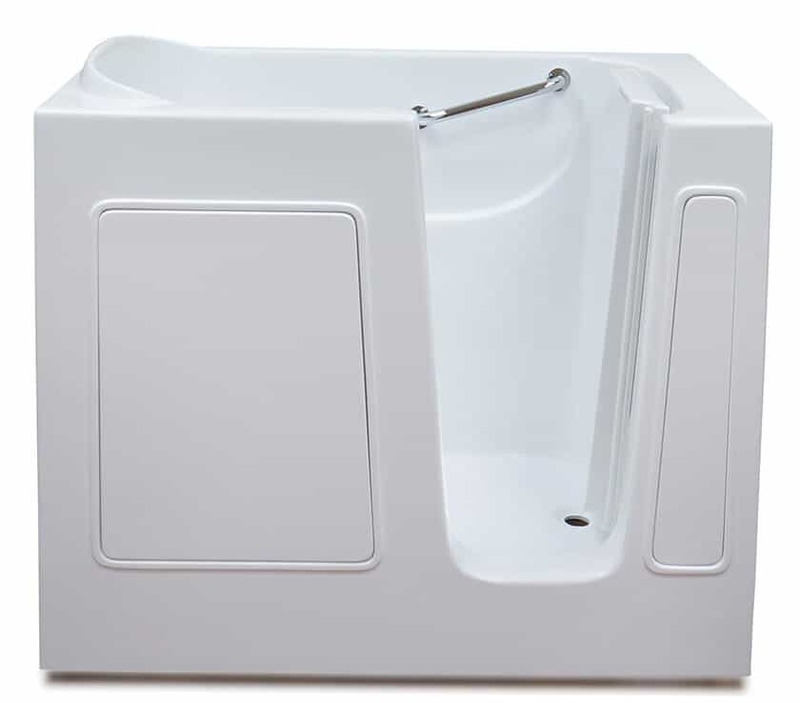 The Care 3048 is one of our roomier models designed to provide you with a blissful bathing experience. Measuring at 29(W) x 48(L) x 39(H), this walk-in tub’s capacity affords you the ability to find a water level that is just right for you as you recline and envelope yourself in soothing waters. We have designed our walk-in tubs to smoothly and efficiently replace your existing shower or bath stall. We provide a wall extension kit to fit a standard 60″ wall opening, so that your new walk-in tub can slot beautifully into your bathroom’s existing floor plan. Our flangeless design ensures the protection of your current tile work as well as cutting the cost and duration of your installation. We offer an adaptable flange kit if necessary. We aim to provide you with a salubrious and auspicious experience with us from your first call to long after your installation is complete. Owning one of our walk in tubs is a worthwhile, long term investment for both your health and your happiness. Quality goes into every aspect of our business from the preplanning and fabrication of each one of our walk-in tubs, to their installation, and the ongoing customer care you may receive once your walk-in tub has become a permanent fixture in your home. Each one of our walk-in tubs is constructed with a one-piece, stainless steel frame which gives your walk-in tub the most solid matrix in the walk-in tub industry. We use woven, marine grade fiberglass in your tub’s construction, which means that by purchasing one of our tubs, you are purchasing the most durable walk-in tub on the market. Many other walk-in tub companies use inferior materials such as acrylic or plastic in their designs. These materials crack easily, not affording the same resiliency over time. Each of our tubs is coated with a triple layer gel coat finish, which adds a beautiful shine to your tub’s surface while also making it easier to clean. Our tubs come in either biscuit or white so that your new walk-in tub will match virtually any existing bathroom décor. Before our tubs leave our factory, they pass rigorous UL inspection and certification. Having one of our walk in tubs means a lot of things. It means that you have a walk-in tub that is safe, convenient to use, luxurious, and of the highest quality available. The CARE 3048 comes with several useful fittings to optimize your bath time. The chrome plated faucet set is elegantly crafted with solid brass construction and is set with hot and cold water taps with a convenient diverter handle to adjust your water temperature. An optional hand held shower hand piece is also available so that you can enjoy both a bath and/or a shower. Recline in your ergonomically constructed, contoured 23″ seat, which lends a luxurious element of relaxation to each bath time. 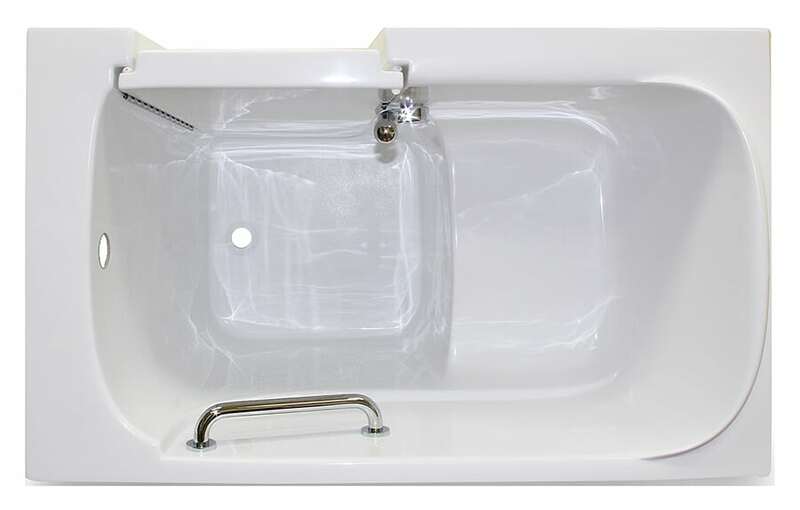 Each of our walk-in tubs comes with a standard 1.5″ drain. You may wish to opt for our 2″ Hurry Drain and secondary toe drain. This feature allows your tub to drain in 110 seconds or less depending on your water level and the efficiency of your household plumbing. Along with our standard fixtures and fittings, you can read below to discover several optional features that we make available, so that you can create your own, sumptuous bathing experience, every time. We have several amazing, health promoting, and convivial customizable features to complement your walk-in tub and enhance not only your daily bathing routine, but also your overall lifestyle. If you suffer from aches and pains due to arthritis or other ailments, you would benefit from and love the experience of our Dual Hydro and Air Massage System. This system targets specific areas of the body to alleviate pain. Ten powerful hydro jets in a V-shaped configuration target the mid to lower back, the back of the legs, and the bottom of the feet. When the bather is reclined, these water jets provide a massaging cushion of pressure for the upper back. Twenty state-of-the-art, 3-speed adjustable air jets are distributed on the periphery of the seat and the floor of your tub. By promoting circulation in key areas of your body, these air jets help to alleviate stress and discomfort. This system also has an automatic cleaning feature which eliminates the stress of constant maintenance. To learn more about other optional features such as Chroma and/or Aroma therapy, Ozone Sanitation, neck pillows, seat cushions and more, please visit our features page. You deserve to derive complete enjoyment from each bathing experience. Treat yourself to an in-home spa experience with a new walk-in tub, and feel refreshed, clean, and energized.